THEMIXLAB: Special Tribute To J DILLA! Plus...Beats, Rhymes & Donuts Mixtape RE-Released! THEMIXLAB is formulated to surpass the masses with dope mixtapes and musical creativity. This podcast supports good music, positive influence, artistic creativity, peace, unity, fun, and God. DJ Fresh Vince spins a variety of genres, primarily REAL Hip-Hop, Underground, Mainstream Rap, R 'n B, Soul, Funk, House, Old School, and other inspired genres. DJ services are available in the Greater Phoenix Area and certain locations of Arizona. 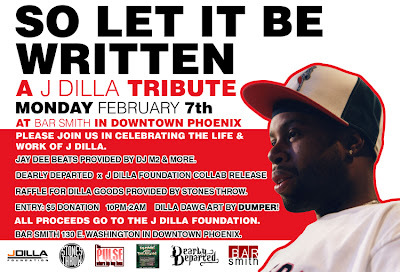 Special Tribute To J DILLA! Plus...Beats, Rhymes & Donuts Mixtape RE-Released! There will be a special event going on here in Phoenix, AZ! Celebrating the life & works of the late J Dilla! See the flyer above for more info. Also, DJ M2 & DJ Fresh85 will be there to provide the mix of Dilla's fantastic musical artwork! AND there's more! DJ JFresh-One & THEMIXLAB also wants to celebrate Dilla's life & work by RE-Releasing a classic mixtape "Beats, Rhymes & Donuts" which was dropped by JFresh-One back in the Fall of 2009! Copyright 2012 THEMIXLAB.net, The Mix Lab Podcast, DJ JFresh-One, Jnx The Kemist. Awesome Inc. theme. Powered by Blogger.